Recent research from Guangzhou Dongsheng Hospital and Guangzhou Social Welfare House1 indicates acupuncture is an effective and safe treatment for heel pain. Heel pain is a common foot condition often characterized by intense pain, especially when placing weight onto the foot. Pain on the back of the heel often indicates Achilles tendinitis and pain on the underside of the heel often indicates plantar fasciitis. 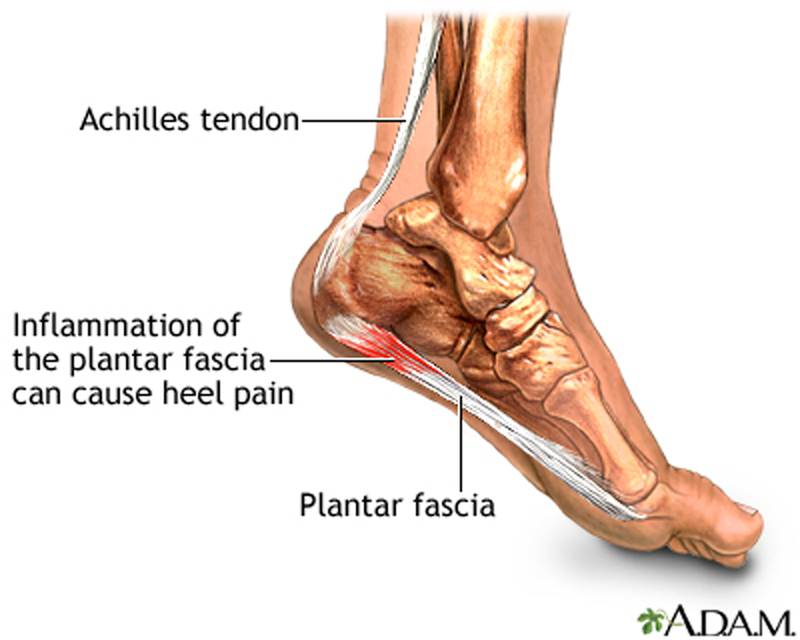 Plantar fasciitis involves pain and inflammation of the band of tissue running across the bottom of the foot. It is the most common cause of heel pain, and occurs in all types of athletic and active individuals. It is commonly seen in runners, and may account for as much as 10 percent of all running injuries. Ill-fitting shoes with lack of arch support can also cause plantar fasciitis. Being overweight is seen in as many as 40 percent of male and 90 percent of female individuals with plantar fasciitis. Fifty percent of the individuals will probably also have heel spurs. For runners and walkers, plantar fasciitis is frequently associated or trigger by a change in training, such as increased mileage, hills or speed. A change in shoes or running/walking surface may also contribute to the condition. Some studies suggest that up to 80 percent of these injuries are due to excessive foot pronation (rolling of the foot inwards). Before starting a running/walking regiment, you should consider having biomechanical imbalance foot evaluation, which can be done a podiatrist. In addition, anatomical problems, like decreased fat pad thickness, leg length discrepancy, or high or low arches may also increase the chance of developing plantar fasciitis. The recent study shows that acupuncture can be an effective form for heel pain and plantar fasciitis. The acupuncture points that are chosen are around the ankle and foot, also points on the calf are used if the calf muscles are tight. It is recommended to treat twice a week for a minimum of three weeks, and then re-evaluate. Most uncomplicated cases will show improvement within six treatments. In chronic cases, continue treatment at least once weekly after the first three-week period. Call today (206-455-4172) and schedule an acupuncture appointment or schedule an appointment online and relieve your foot pain today. This entry was posted in Acupuncture, Acupuncture and Pain and tagged acupuncture, foot pain, heel pain, pain, plantar fasciitis. Bookmark the permalink.